Religion: Our mission is to pass on the Catholic faith so that it is understood, valued, and integrated into the whole of a student’s life. In our Religion text, We Believe, God Loves Us, by Sadlier, the four pillars of the Catechism of the Catholic Church-Creed, Sacraments, Morality, and Prayer are taught and developed. In addition, our chapters are built on the six tasks of Catechesis: Children will LEARN what Jesus taught us about the love God has for us. Students will focus on how we gather in church to worship God and CELEBRATE the sacraments. Children will understand that Jesus taught us how to show love for God, ourselves, and others – we CHOOSE to follow Jesus’ example. Our classes will PRAY in different ways alone and with others and will pray the Lord’s Prayer as Jesus taught us to do. Children will learn to SHARE God’s love with their families and parishes. We will spread the Good News of Jesus through simple acts of love and be caring. Our students will come to see that our FAITH IS MEANT TO BE LIVED. Our four units of study will develop the following topics: Jesus Teaches Us About God’s Love, We Are Followers of Jesus, We Belong to the Church and We Celebrate and Live Our Faith. 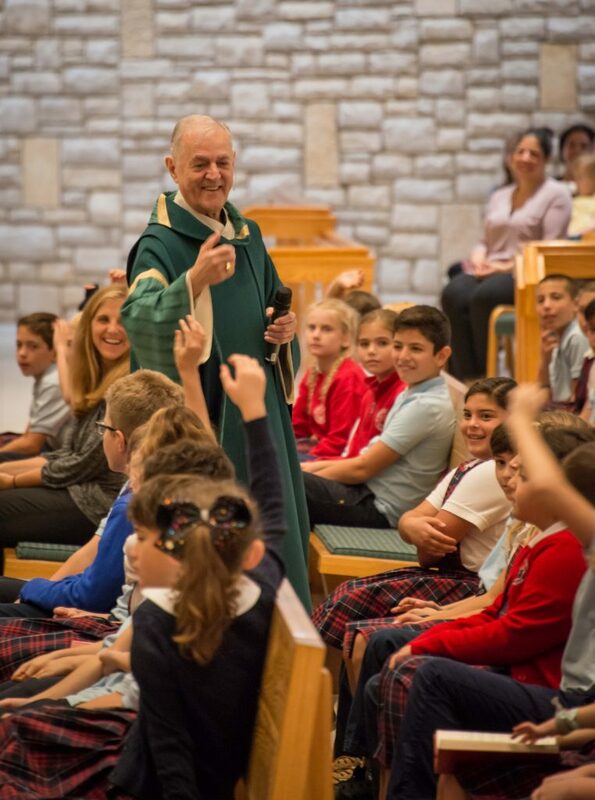 Liturgical Season lessons give the children the opportunity to celebrate and prayerfully participate in the liturgy all year long. The Sign of the Cross, Our Father, Hail Mary, Grace Before Meals and the Glory Be are introduced or reviewed. The First Graders participate at Mass every Wednesday beginning in November and at All-School Masses. At times the students are involved in planning the liturgy. English: First Grade Grammar instruction is taught within the daily Reading class. 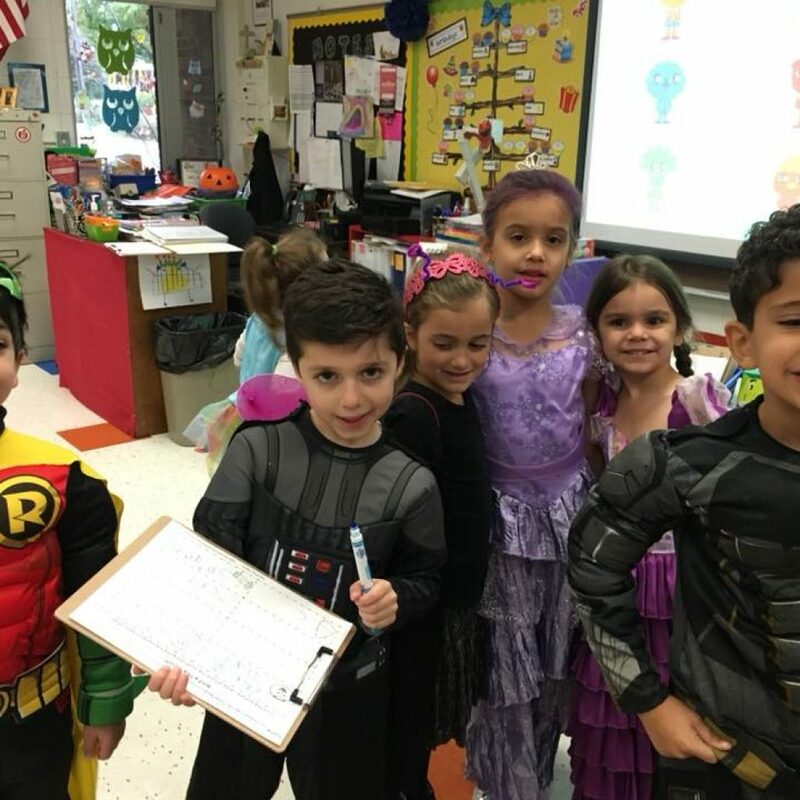 Our lessons will focus on recognizing complete sentences as statements, questions, or exclamations, and accurately using correct punctuation and capitalization in our own written work. Identifying the subject and predicate of a sentence will be introduced. Parts of speech, including nouns, verbs, adjectives, pronouns, and adverbs will be identified. Reading is a daily one and a half hour period. Our Reading series, Journeys, by Houghton Mifflin Harcourt, is organized into six units of study, emphasizing systematic instruction in the areas of reading, fluency, writing, speaking and listening, and language. A sequential phonics approach is utilized in word decoding instruction. Opportunities to apply decoding skills are provided in the meaningful text, from decodable to authentic literature. Along with each story presented, the students practice phonetic skills, are introduced to high-frequency words, and are involved in language, content-area, and comprehension instruction. Our goal is to see that each child reads with fluency and understanding. In an effort to foster a love of books and a life-long habit of reading, children are encouraged to read at home by completing required monthly Reading Logs. Students also have the opportunity to visit the school library with their homeroom class. Recognizing that each child is skilled differently and gifted differently, opportunities for reinforcement and enrichment are available. Our Phonics program consists of recognition of beginning, middle and final consonants, short and long vowel sounds, blends and digraphs. Our phonics text is Phonics Level A from Modern Curriculum Press. Spelling is introduced mid-year. Words to be mastered are taken from the Dolch Sight Vocabulary list and from the reading program. A weekly test will be given every Friday. Handwriting is taught daily. We teach the Zaner Bloser method stressing correct letter formation, pencil grip, and paper position. Math is a daily fifty minute period. Unit objectives will include the ability to use various addition and subtraction strategies for facts to twenty, including the use of fact families. Students will be introduced to guided practice in problem-solving techniques. We will identify, write, order and compare numbers through 120. Students will learn to tell time to the hour and half-hour using analog and digital clocks. Plane and solid shapes will be taught along with an introduction to fractions. Place value to 100 and ordinals will be covered. The children will be introduced to various types of measurements. Unit objectives will also include the ability to add and subtract two digit numbers without regrouping. Our text is Math is Progress in Math by Sadlier-Oxford. Rocket Math is also done within homerooms to increase the mastery of addition and subtraction facts. Our Social Studies curriculum strives to help each child to become an active, involved and informed citizen. Units of study in our text, All Together by Scott Foresman, include a look at aspects of life at school and in a community. We will look at how people work to fulfill their needs and wants. Students will study our earth and its resources, and learn about people and events that have helped shape the history of the United States. In our final unit, the students will learn about the market, decision-making, technology, and inventions. Our new Science text, Interactive Science by Pearson, begins with an investigation of the Nature of Science, which introduces students to the Scientific Method, followed by a look at the Design Process. Further units include Living Things and Their Environments, Plants, and Animals, and Earth and Sky in which we investigate rocks, soil, land changes, our natural resources, and the sun. In our Weather unit, we will explore the water cycle and the four seasons. Matter, Energy, and Movement units will involve a look at the states of matter, light and sound, and the forces of magnetism and gravity. 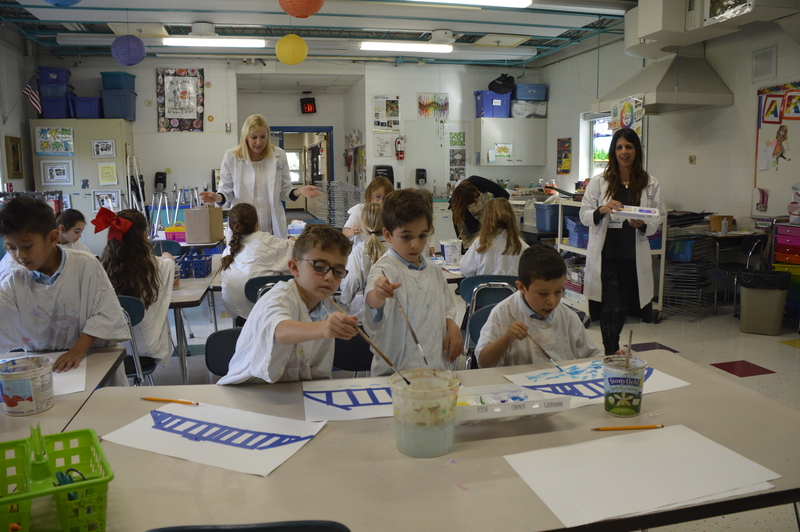 Art: Students visit the Art Room once a week for a 40-minute class. We introduce students to a variety of materials. Our Art Committee presents Art Appreciation once a month. 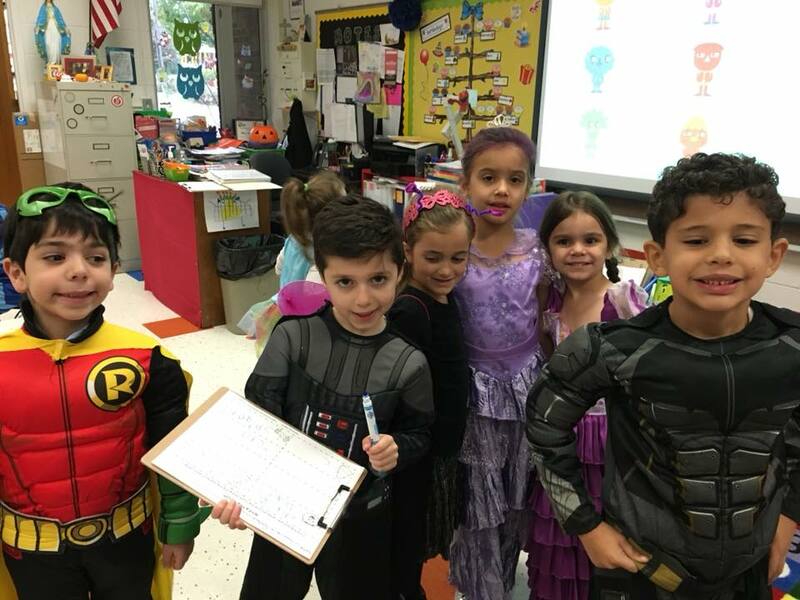 Computers: Students in first grade will build on skills learned in Kindergarten. They will use home row keys and will learn more function keys. They will begin saving, printing, formatting, and inserting graphics into simple word processing documents. They will continue to explore ethical computer use. They will continue to demonstrate proper etiquette, behavior, and body position when using computers. All students participate in a basic Computer class every week for a one-half hour. Library: Students review Library Rules and Procedures, learn about Book Care, Parts of a Book, Story Time Behavior, Author of the Month, participate in March is Reading Month Themed Weeks and activities and students can check out 1 book to take home for 1 week. Music: First graders star performance: the annual Christmas Pageant in December. In addition to performing, students have classroom music- sing, dance, read & notate music, listen, compose, evaluate and make connections with music through history and culture. Music theory is taught once a week. Physical Education: students attend gym class twice a week. Fundamental movement skills which are taught using play-based sports-sampling to get students comfortable and confident moving. Spanish is introduced for a twenty-minute period each week. Students develop the foundation to develop communicative competence in Spanish. They expand their vocabulary and are introduced to key grammar concepts.